When I was in my early thirties, I used to make bead necklaces. It was fun while also being a source of endless frustration. For every successful necklace that got worn, there were several others that just didn’t work out. I was constantly taking them apart, dissatisfied, and trying to re-work them into a form that pleased me. I could never predict what colors or patterns would look good together, so it was all trial and error, and very time-consuming. Eventually I lost interest. I put away the big box of beads and the fishing tackle box containing my pliers, different lengths of cord, and assorted clasps and crimps. The tools came in handy once in a while, when a clasp needed to be replaced or a strand needed to be lengthened or shortened, but that was about it. So I’m not sure where or how I recently decided to try my hand at making stretch bracelets. I think the seed was planted by Debbie at She Accessorizes Well (my accessory muse, who by now is probably starting to think I’m a creepy stalker!) She ran a post back in February showing her handmade bracelets, and although I immediately forgot about it, the idea took root somewhere in my subconscious mind. It certainly helps that bracelets are so big right now. I’ve been adding a lot of them to my collection in the past six months, and most of them are stretch bracelets rather than cuffs or bracelets with clasps. And since the stacked look is also really popular at the moment, I’ve been trying them in different combinations. One day last week, when I struggled with groupings that just weren’t working, I started to fondly remember the days when I could make my own accessories to fit my needs. Now, I never had good luck making bracelets, but I always made the kind that were fastened by metal clasps. They tended to be too loose and floppy, because if they were tight enough to hug the wrist, they were too tight to fasten without help! In contrast, the stretch bracelets I’ve been buying are easy to put on, and they tend to fit and stay put more comfortably. So I got an idea. I looked more closely at the new bracelets. Hmmm…. stretchy, elastic-type cord. Tied in a regular knot. How hard could it be? So I went online and found some instructions here, among other places. Amazing! When I went through my first beading phase, the World Wide Web was still a mysterious place that I didn’t understand and rarely visited. Think what I could have done if I’d had a whole, wide world of blogs and YouTube videos to guide me! which were surprisingly inexpensive and easy to find. And off I went! I spent the better part of one evening and one Saturday playing with my beads. I’d forgotten how much fun it was to experiment with the different colors and textures, trying multiple combinations. I’d also forgotten how the fun wears off at about the 90-minute mark. I’d forgotten that, if you choose to do your beading while sitting crossed-legged on the floor with your materials spread out around you, your body will get stuck in an unyielding pretzel formation unless you stand up from time to time. I’d forgotten that it’s hard to do this if you can’t get up off the floor. I’d forgotten that, the longer that you sit, the harder it becomes to get up. And let me assure you: these things have not gotten any easier in 15 years’ time. I’d also forgotten about the beads with teeny-tiny little holes that defy your attempts to thread them. And the way your hands cramp up when manipulating the pliers. Sadly, these difficulties have also gotten worse with age. To put it simply, I’d forgotten how much profanity enters the picture during hour two of beading. But overall, I have to say that stretch bracelets are easier to make than the necklaces that I used to create. The instructions in the link above are a good start, but you might also want to look at some YouTube videos like this one. (That’s the only way I could figure out how to tie the knots). At first I wasn’t at all sure that the knots would hold, but I think I got it. I’m less sure about the whole glueing-the-knot thing. 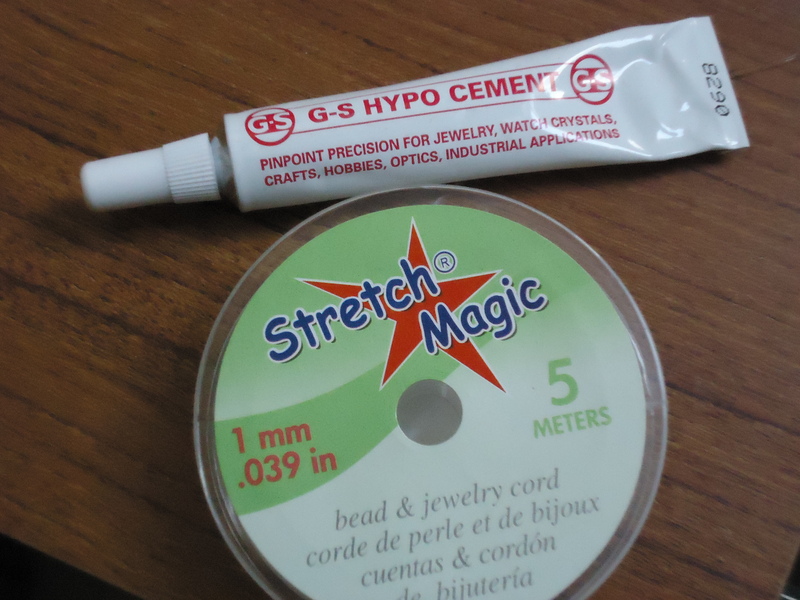 If I thought beads with teeny-tiny holes were bad, I hadn’t seen anything until I encountered the microscopic applicator tip of the G5 Hypo Cement, designed for close work in small spaces. I could barely see where the glue was coming out of the tube, let alone where it was going! And then the needle-like tip of the cap stubbornly refused to be inserted back into the tube afterwards. You know how hard it can be to thread a needle? Imagine that the needle is oozing glue the whole time. Now you get the picture. I must confess to being rather pleased. I’ll spare you a blow-by-blow description of all the complexities of stacking bracelets. I’ve tried wearing multiples before, and I often have difficulty — they catch on each other, they clash or blend too much, they overwhelm each other so that the whole is less than the sum of its parts, and on and on and on. I have no easy answers. It’s all trial and error. I tried many, many combinations of these new bracelets with my previously acquired ones, but I didn’t like most of them. The grouping shown here was my favorite by far. If you’re looking for further inspiration, I recommend the Bloggers Do It Better “Arm Party” on Pretty, Shiny, Sparkly. Yes, I’m seven months late to the arm party. Better late than never, I guess. Now, I can’t swear that I’ll love these as part of an overall outfit. I have a secret suspicion that stacked bracelets may look best up close; I liked the photo better than I liked the bracelets in a mirror. From a distance, I wonder if they might just look like a haphazard mess. But I will have fun figuring it out. And next time, I will do my beading at a proper table with an ergonomically correct chair. One must adapt to changing circumstances, after all. How about you? Have you experienced any adventures in beading or jewelry-making? Do you wear stacked bracelets? Do you have any tips for either making or stacking them? Reflections on beauty and style, for women who weren't born yesterday. Bring your sense of humor and "Fight the Frump" with me! This entry was posted in Fashion and tagged accessories, beading, beads, bracelets, DIY, fashion, over 40, stretch bracelets, style. Bookmark the permalink. Before I answer your questions I must say I love your new bracelets – they each have such an eclectic color combination (no I don’t mean that in the way my mom would say it, I mean the good eclectic ;-)) and they look great together in the stack. Now to my beading experience: I am one of those short attention span craft craze people who can not resist craft supplies or pretty colors. Beads are pretty-colored *and* craft supplies so I have a chronic attraction to them that’s hard to overcome. But everytime I sit down to actually make something with the beads, I get tired, frustrated, or temporarily blind before I finish the project. I’ll start something else, the beads will sit there for weeks, and finally I’ll clear the whole mess off the table and put it in a drawer. 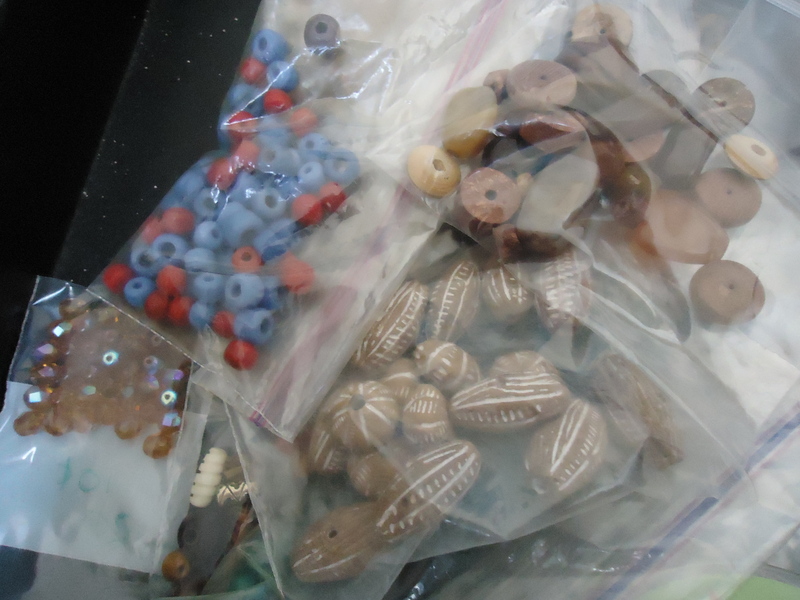 There is now a large dresser drawer with all my beads, findings, and partial projects, and I’m afraid to open it. And what’s really pitiful is I keep buying earrings and bracelets. Madness! When my daughter was too little to have small beads around, I started stringing my beads on elastic in a nearly impossible to break way. I cut the elastic 3 or 4 times the finished length plus what was needed for the knot. I then threaded all the beads on the elastic, and ran the elastic around and around through the circle of beads, so that it ended up with 3 0r 4 strands going through the beads, but just the one knot. So even if the knot did break, the beads were still secure on the continuous elastic thread. Then you can glue the knot or use a crimp bead for a more secure knot. Even thought you might have to use a little thinner elastic thread, depending on the size of the hole in the bead, I always ended up with a more secure piece of jewelry. Hope this makes sense. I’m having a little trouble visualizing that (I’m spatially-challenged, which is part of the reason why there’s such a high margin of error in my jewelry “design”). Was it difficult threading the elastic back through? It seems like it could be, at least for me (with the cramping and the swearing and the poor eyesight, and all!) But it sounds like a smart and effective innovation! Love this post, very amusing! The end result looks great – must be fab to wear something so unique. I’ve often thought about jewellery making but I spend enough on making cards and scrapbooking. Plus you have highlighted some of the pitfalls of making jewellery (which I wasn’t even aware of). But you carry on —- maybe start selling your bracelets at Etsy? 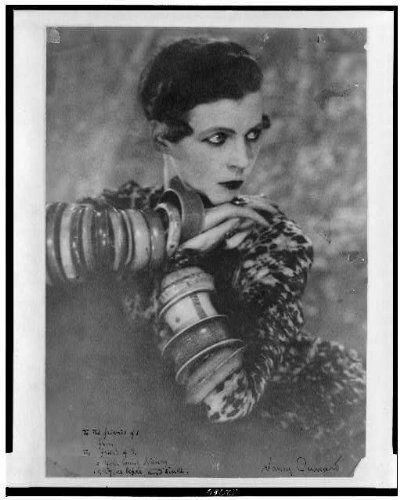 I have no history of jewelry-making, and I am a little heavy-fingered – and I *love* your bracelets. They are beautiful together and would be just as fab worn singly, I think. Your description of the process sounds so . . . real : > that’s why I adore your writing. Been there, done that — I have the huge tackle box of beads and wire and beading tools sitting in my house, too. I have even bought stuff for a couple of projects in the last 12 months, but do they get done? No. Some weekend I am going to revisit my wire-wrapping skills and make the cheapster version of this necklace. Very pretty! Good for you — wire wrapping is a little too ambitious for me, I’m afraid. I’ll look for that necklace on your blog! ROFL–been there done that!!!! Love the new bracelets!! you’ve inspired me to dig in my stash and make some new bracelets for spring! Love them! Great color and texture. I think I need to make some spring bracelets for myself today and maybe get a post together to host my own spring arm party over at Make Bracelets! I’ve been wanting to do that for awhile. Great post! Thank you! And thanks for providing such clear instructions in your blog. Wow…you did great…maybe you are destined to be a jewelry designer!! I just don’t have the patience or time for it…I would rather watch you!! Please stop by and enter my current contest…you would love this book and find it to be very inspirational!! I made a few stretch bracelets last summer by taking apart and re-suing the beads from some cheapy Target ones. They match my summer wardrobe colors, and I’m looking forward to wearing them again soon. I’m resisting the temptation to launch full-scale into beading, though. Yours came out very nice, and remind me of the necklaces you posted recently. Perhaps they are some of the same beads? Ha ha! While I did take beads from two existing necklaces, I didn’t wear either of them in the necklace post. I guess I’m just very consistent in my tastes — gravitating toward the same types of beads over and over. You’re bracelets are very pretty, very creative. I am sooo not a crafter. I’m kinda jealous of people who are. Anne, I’m so pleased to have discovered your blog (thanks for commenting at mine), and I’ve added you to my RSS feed reader. You know I love, love, love those bracelets! Why, thank you! I’m happy to have found your blog, as well! I have a broken necklace that I’ve wanted to turn into a bracelet and was totally unaware that this stretchy stuff existed. Now, you’ve got me interested! Look what Debbie has started!! 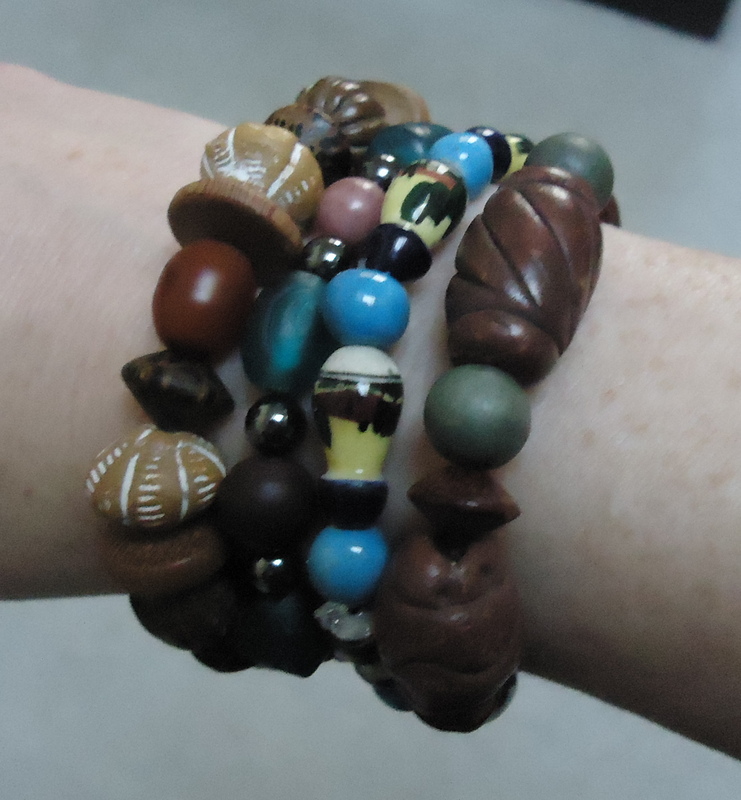 I really like your arm party–the natural colors of the mix. I know! The stretchy stuff is pretty great. Who knew? I converted one of my necklaces into a bracelet, too. Thanks, Rae! I must have a little UK in me, because I totally think funky is a compliment! (And yes, I do always take the bracelets off when at the computer). I love your bracelets! And I like the grouping you came up with. I haven’t worn bracelets much – but seeing your project I would like to. I’m afraid I’d have to buy them, though. I like your writing and your description about your process and sitting on the floor. You said it exactly. I sit on the floor when I do hand-sewing. I look forward to seeing more of your creations! I’m on the same wavelength. So much nice jewelery around and many of them so easy to make, so why don’t I try and save money and use my creative energy? And I warn you: once you start you never stop. So much interesting stuff in the blogosphere. 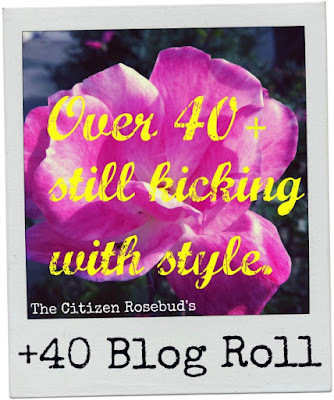 I suggest you visit a pair and a spare.com and check her blogroll to get you going. (if you haven’t already).Your bracelets are super cute! Sorry it has taken me so long to get to commenting on this post. Thanks for the mention! It was sweet of you. I think you did a wonderful job of stacking the bracelets and putting them together too. I have always thought that half the battle of creating them is deciding on the beading pattern. Do you have one of the trays for laying out necklaces and bracelets? It makes designing so much easier. Also, you asked about necklace extenders. If you can make jewelry you can make one yourself. It is basically a chain with a jumpring on one end and a clasp on the other. I often use thin metal bracelets as extenders. I hope to do a post on how to shorten and lengthen necklaces easily. When using the stretchy thread I often tie a knot but leave one tail longer then put it through a couple more beads and then tie another knot. I don’t know if you tie with a surgeons knot, but it is a good knot to use. If you ever want any advice or info, please don’t hesitate to contact me. I keep pinning and pinning things that I want to make. Hopefully now that I got laid off, I’ll be able to make some of it! Great job with the bracelets! Definitely wear them.